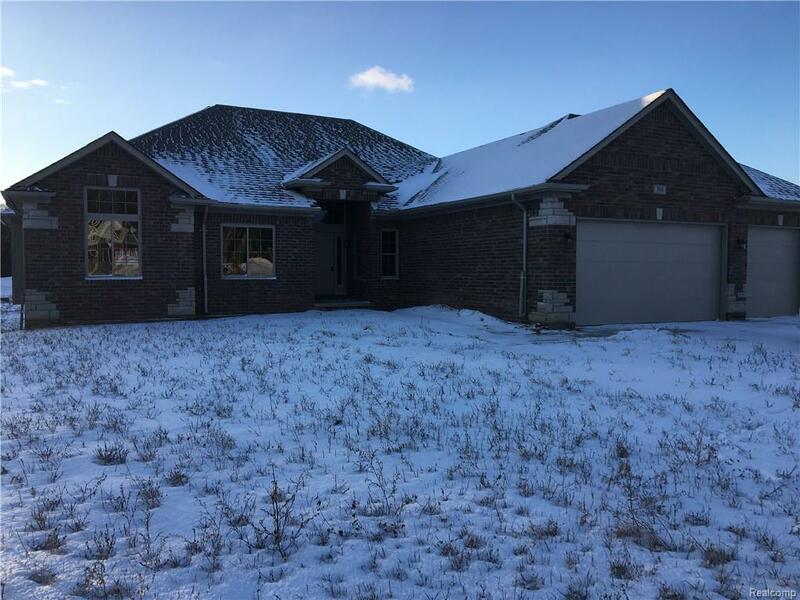 Custom-built brick ranch home on two acres in exclusive Preserves Subdivision featuring a spacious, open floor plan with custom cabinets and granite counter tops throughout. Gorgeous kitchen includes island, large pantry and door wall leading to beautiful views. Great Room has a natural gas fireplace, tile surround, and wood mantle for cozy ambiance. Private Master Suite has a pan ceiling in bedroom, ceramic tile, jetted tub, granite counter top with double sinks, and separate ceramic shower for a spa-like feel. Upgrades throughout include full brick exterior with stone accents, designer baluster on open staircase, 3 car garage, and much more. Allowances given for appliances and carpet. Move into this beautiful home this Spring! Please note: Photos shown are of previous model; floor plan is exactly the same. Photos will be updated when home is finished.